Day 01: Arrival in Katmandu, transfer to hotel & wel come diner. After refreshment sight-seeing tours to Katmandu Durbar Square and Swayambhunath. Day 02: Sight-seeing tours to Pashupatinth, Boudhanath and Budhanikantha. Day 03: Katmandu-Nagarkot. Sight-seeing tours to Bhaktapru and Chanfu Narayan. Drive to Nagarkot for overnight stay. Day 04: Nagarkot-Katmandu. Early morning Sunrise view over the Himalayan Panorama. 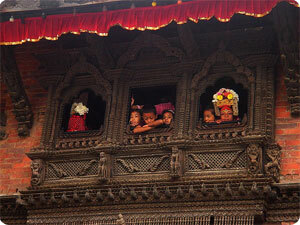 Drive to Patan for sight-seeing tours. Overnight hotel in Katmandu. Day 05: Sight-seeing tours to Kirtipur, Dakshinakali and Chobhar. Overnight hotel in Katmandu..
Day 06: Katmandu-Daman. Drive to Daman along Tribhuvan Highway. Overnight in Resort. Day 07: Daman-Chitwan. Early morning, you will go to tower to enjoy the Himalayan Panorama view. After breakfast, you will drive to Chitwan National Park. Day 08: Chitwan. Taday you will be kept busy in jungle safari activities. Day 09: Chitwan-Lumbini. After breakfast, you will drive to Lumbini, the birthplace of Lord Buddha. Day 10: Lumbini-Tansen. After a 4 hours drive along a rough hilly roads, you will arrive at Tansen. Day 11: Tansen-Pokhara. After a drive of about 5 hours, you will arrive at Pokhara, the second most popular tourist destination in Nepal. You will take a full day sight-seeing tours in Pokhara valley. That includes visiting temples, caves, gorges and waterfalls and boating in lakes as well. Day 12: Pokhara. Early in the morning, you can drive to Sarangkot view point (1600m) for a sunrise view over the Himalayan panorama. Then, you can drive back or walk back to Pokhara. Day 13: Pokhara-Gorkha. Today, we are bringing you to witness the home of original Gurkha warriors who have been famous in the world for their bravery and honesty. Day 14: Gorkha-Kurintar. Kurintar lies on Pokhara-Kathmandu highway on the bank of Trisuli river. Day 15: Kurintar-Kathmandu. After Breakfast, you will leisurely drive back to Kathmandu. Day 16: Sight-seeing tours to Bungamti, Khokana and Panauti Village and Overnight in Dhulikhel. Day 17: From Dhulikhel, it is an easy hike to legendary Namo Buddha shrine. Day 18: Dhulikhel-Kathmandu. Drive to Kathmandu and a free afternoon. Day 19: In the morning, you can take an optional mountain flight trip over the Himalayas & farewell diner. Day 20: Back to onward destination.